Although it is being said that Hottō of Yura [Shinchi Kakushin] was the founder [of the komusō], that I do not ascertain. One hears that, since ancient times, this thing [the shakuhachi] was used by the 'boroboro' practitioners, and also that the socalled 'bonji', 'kanji', iro-oshi', and 'shira-bonji' were people who performed this shakuhachi ceremoniously. There are nowadays some outcasts [Jap. : fu-nin, "non-persons"] who are called 'komusō'; they are blowing a piece of music named 'Goro' - besides there are other tunes such as 'Renbo Nagashi', 'Miyako Renbo', 'Samunaru Ikawa', and 'Yoshida'. One does not hear any of these pieces being played in the 'ritsu' [Dorian] or the 'ryō' [Mixolydian] musical modes. As this, however, is not the tradition of my own, I do not know about this matter in depth." 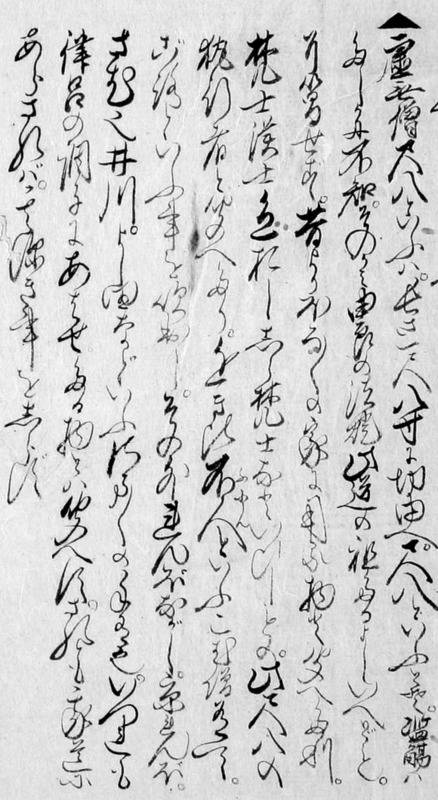 Written and published by Nakamura Sōsan, 1664. Part 1, p. 6, owned by Waseda University, Tokyo. in which names of komusō music pieces are recorded. (PDF, 15,8 MB) of the book: Shichiku Shoshinshū. Go to PDF page 5, right side, to study the komusō chapter. Link to Shichiku Shoshinshū, bibliographical details. Copyright restricted © by Waseda University, Tokyo.